There has been many a times where i updated my Facebook status and later to realize that i did a embarrassing typo in my post . Unfortunately back then Facebook did not had an option to edit posts , which obviously made me look like an idiot sometimes . Further since most of these posts were shared multiple times , so deleting the post was not an option . Now you don’t have to worry about those embarrassing typos anymore . Facebook has introduced a new feature , which allows uses to edit their own posts . This is indeed a much needed feature and does bring a feeling of respite . Right the the Android and web version of Facebook have been updated with this feature , while a iOS version of this update is on the way soon .Now Facebook users will be able to edit their own posts and comments incase of any typos or errors . 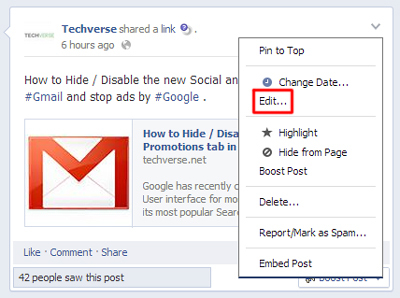 Here is how you can edit your posts in Facebook . Note: Currently you can only edit all your posts and comments posted through Facebook , any posts shared from outside of Facebook cannot be edited . 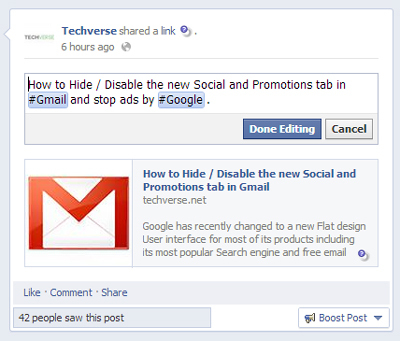 Step 1: Hover your cursor to the top right of your post and click the arrow symbol . select edit and edit your typos . Step 2: When the editing is done , click on “ Done editing “ to update your edited post . Its that simple as that , the same feature is also available though an update on Facebook for Android .